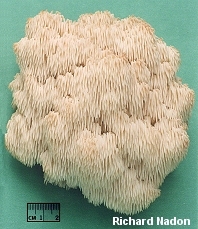 Hericium americanum is North America's only Hericium species with long spines and a branched fruiting body. It is apparently found only east of the Great Plains, fruiting from dead wood or live trees. Though it is more frequently found on hardwoods, it is documented on conifers. When young, before the branches have developed, it might be confused with Hericium erinaceus; be sure you are examining mature, fully developed specimens before proclaiming your identification to God and country. Speaking of countries, if this mushroom were a country between Greece and Italy, and if international diplomats had recently named it, rather than mycologists, it might be called "FYROHC"--the Former Yugoslav Republic of Hericium coralloides. Like FYROM (the Former Yugoslav Republic of Macedonia) or the "artist formerly known as 'Prince,'" Hericium americanum has a former name that is more recognized and popular than its new name; it used to be "Hericium coralloides." 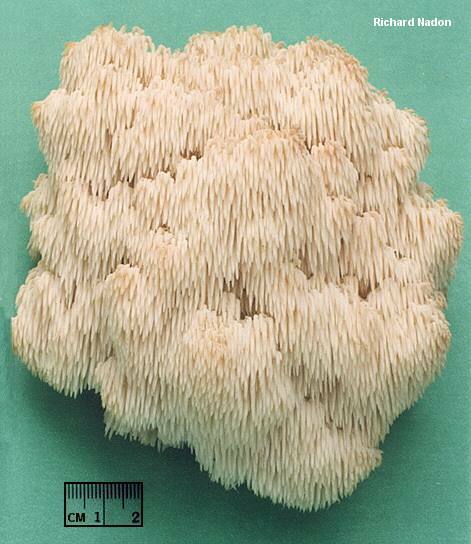 Unlike FYROM or Prince, however, the folks in charge have gone and used the former name for something completely different: the short-spined, branched Hericium coralloides (which, in turn, was formerly known as "Hericium ramosum"). Whew! Ecology: Saprobic and possibly parasitic; growing alone or gregariously; fruiting on dead hardwood logs and stumps, or from the wounds of living hardwoods; documented to fruit (rarely) on conifer wood; late summer and fall; east of the Great Plains. 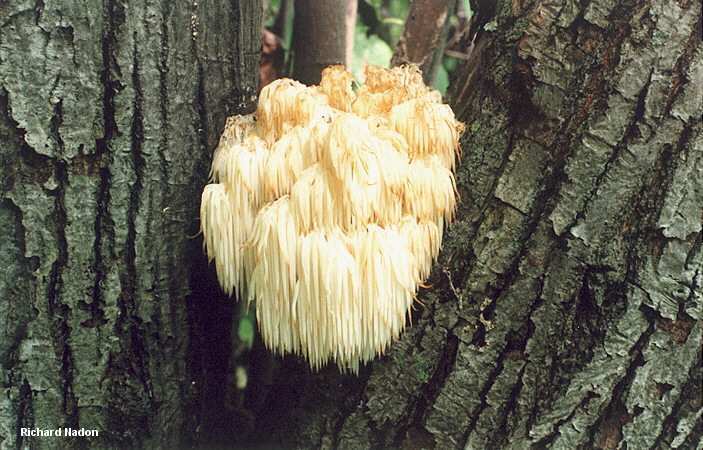 Fruiting Body: 15-30 cm across; consisting of a tightly branched structure arising from a rooting base; with densely packed spines .5-4 cm long hanging from the branches in clusters or rows; white, or in age discoloring brownish to yellowish. Flesh: White; not changing when sliced. Microscopic Features: Spores 5-7 x 4.5-6 µ; elliptical or subglobose; amyloid; smooth or minutely rough.